Natural habitat: It originates from/in mediteranean area, but it also grows in salty soils of North and South America, Europe, and Africa. Description: Biennial herbaceous plant, grows to 1m tall. 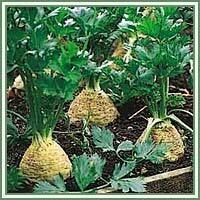 It has a fleshy, rounded root and a furrowed, branched stem. The leaves are pinnate to bipinnate, dark green and shiny with rhombic, coarsely toothed leaflets 3-6 cm long and 2-4 cm broad. The flowers are creamy to grey white, 2-3 mm in diameter, appearing from July to November. The seeds are broad and egg-shaped, 1.5 to 2 mm long and wide. Compounds: Source of potassium, folic acid, phosphorus, calcium, carbohydrates, protein, dietary fiber, vitamin A, vitamin B-complex, vitamin C and vitamin E.
Medicinal use: The juice extracted from the petioles can be used for edema, rheumatic tendencies, gout, flatulence, chronic pulmonary catarrh, tendencies toward overweight and lack of appetite. It is a strong diuretic, and is used as a urinary antiseptic, mainly because of the volatile oil apiol. Still, Celery shouldn’t t be used when a person suffers from acute kidney problems (moderate use is permissible only when kidney problems are chronic). 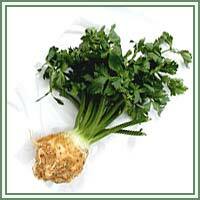 Celery can be helpful in treating skin problems, when it is used raw, or prepared as tea. Celery seed decoction is used for bronchitis, rheumatism, and as a sedative. Seeds are also used as a blood purifier, and are very helpful in treting arthritis. Oil extracted from the root can restore sexual potency affected by illness. Safety: Avoid the use of essential oil in bright sunshine. Substance called bergapten increases photosensitivity, so direct sun exposure is not advisable. Also, Celery is known to provoke serious allergic reactions, and the allergen cannot be destroyed at cooking temperatures.